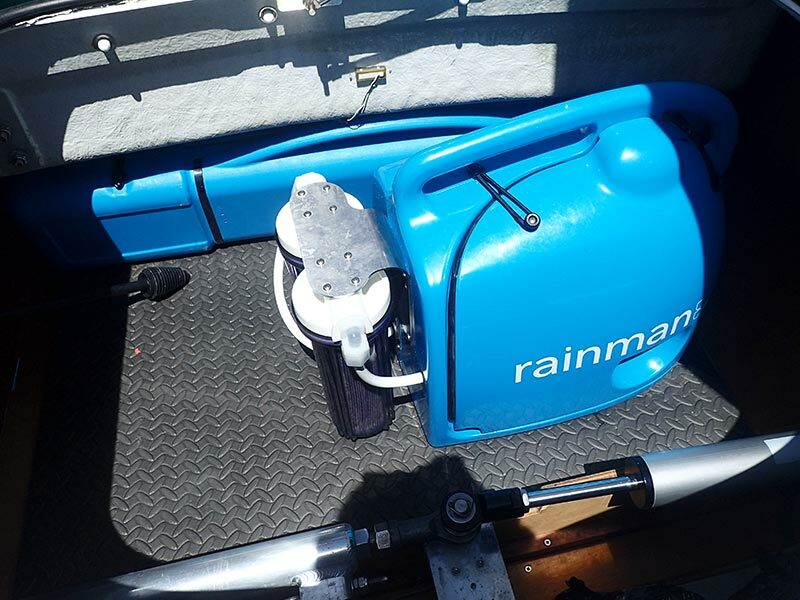 Rainman watermakers: No extra holes in the boat! 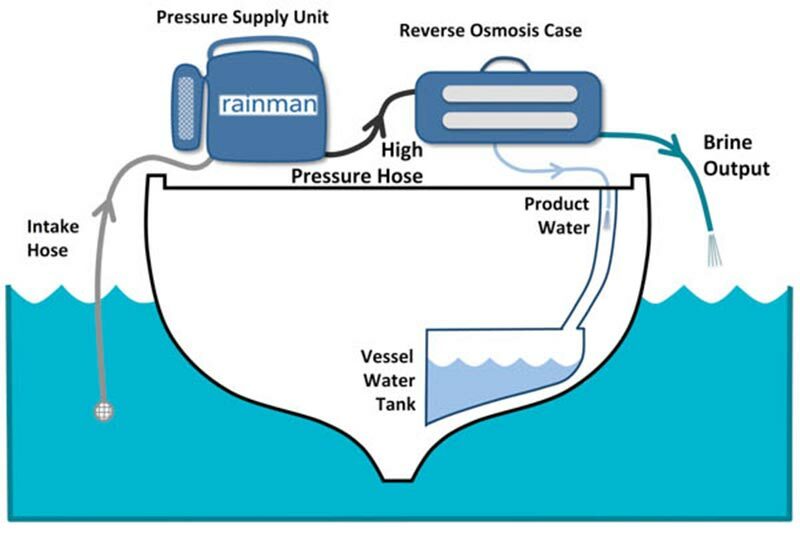 I first read about Rainman portable watermakers (desalinators) some time ago, and I admit that I was very intrigued by the concept. I don’t typically write about products unless I have first-hand experience using them though, which is why I have, until today, failed to mention this unique concept here on this blog. When I noticed that our boat neighbors, Gary and Marie, had one on board, and seemed to be using it quite regularly, I made up my mind to invite myself over to check out their system. 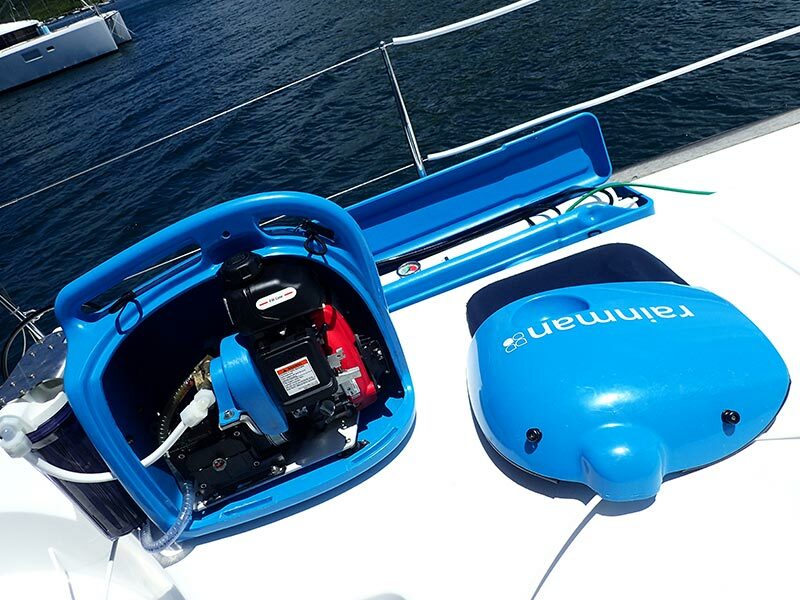 Gary was more than accommodating, welcoming me onboard to give me a complete overview of how the watermaker works. What I learned follows below. I noticed that the guts of the motor looked a lot like the Honda 2000 generator that we had on ZTC. I guess that makes sense because the Rainman brochure says that the motor is made by Honda! When running, the volume of the motor is also equivalent to a Honda 2kW generator, which are known to be relatively quiet. The image below shows how the hoses are routed. 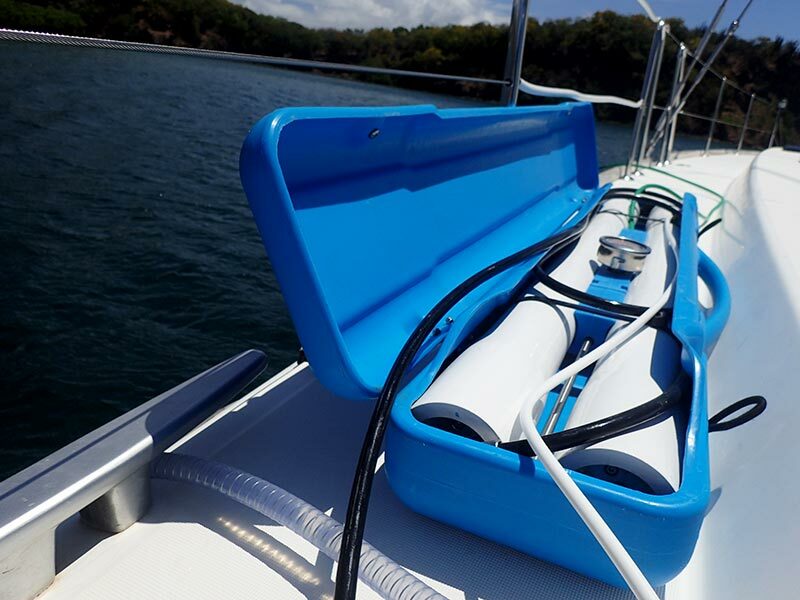 From the membranes, the brine discharge line (green) is dropped overboard, the high pressure hose (black) is connected to the motor, and the product water output is led to wherever you’d like (deck fill, jerry can, etc.). The intake hose, from the motor unit, is also dropped overboard. Gary mentioned that he tries to keep the intake line, and the brine discharge line, somewhat apart from one another. 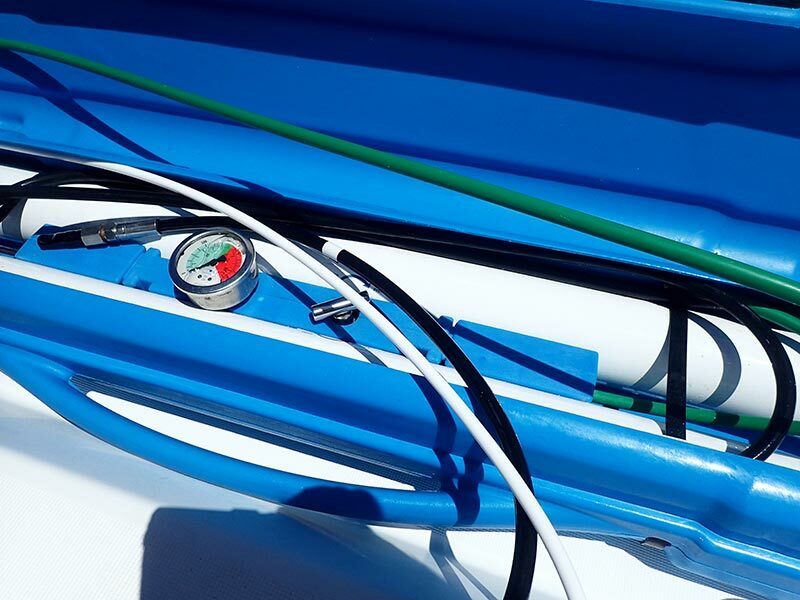 The big advantage of a system like this is that it requires no additional holes in the boat to operate! 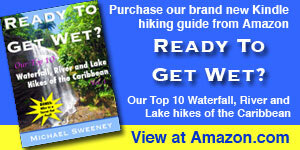 Note: I would not rely solely upon taste for testing the product water quality as they show in the above promo video. We use a TDS (total resolved solids) meter to check the salinity of a watermaker’s product water, in addition verifying that it tastes and smells OK. Our friend Gary does the same. 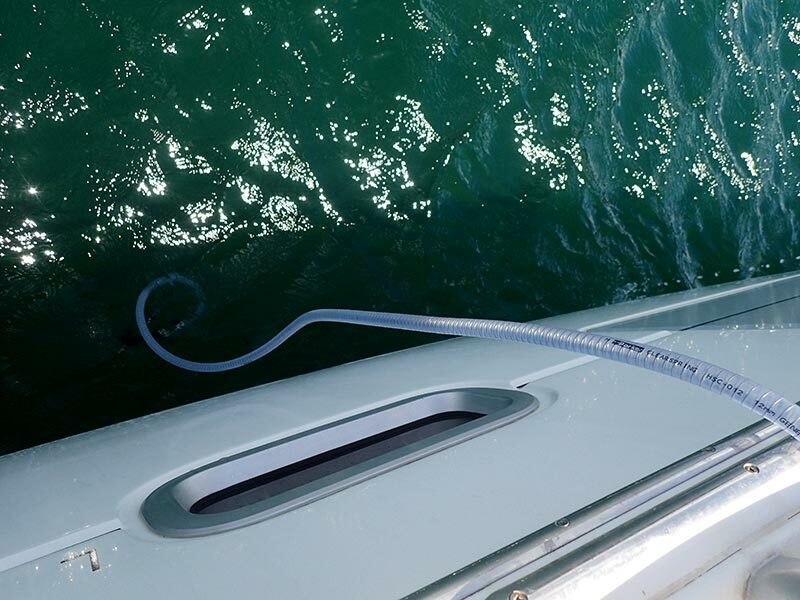 You can see the raw water intake hose is overboard in the image below. The hose has a 1-way valve on the end, and I believe that Gary told me that there is an optional extra filter that can be added to the end of the hose, for use in extra-silty water. The non-proprietary membranes are stored in their own carry case. There is a pressure adjustment valve mounted to the membranes, and a pressure gauge so that you can dial in the perfect operating pressure. As a bonus, there is also an optional pressure washer gun that can connect to the unit. Pretty cool, eh? 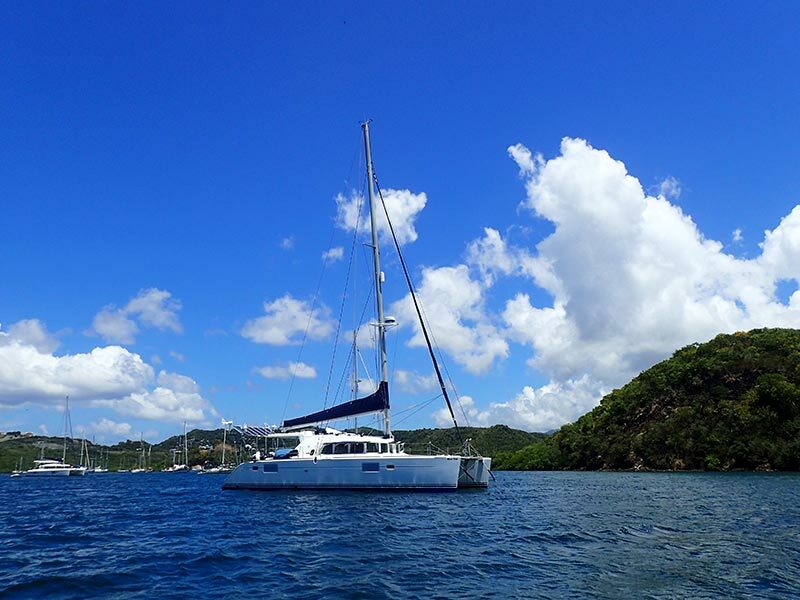 Gary and Marie sail on a beautiful Lagoon 440. We first crossed paths with them in Barbuda back in 2012 when we were sailing on ZTC. It’s been very nice to re-connect with them here in Grenada. Big thanks for inviting me on board to check out the watermaker! It’s worth noting that we have nothing to do with the Rainman company. We are not sponsored by them, or affiliates, nor did I contact them before writing this post. I just think this is a pretty cool concept, and were I in the market for a new watermaker, I would definitely consider one of these portable systems. Very cool! Did he say what size generator it would need to run it if you got the non gas generator version? I’m assuming that a built in diesel generator would do the trick too, correct? Any feed back on fuel consumption Mike? A full 0.77 litre tank on our system will operate for approximately 70 minutes, depending on the fuel quality. The amount of water made in this time will depend upon which RO membrane configuration you have and water temperatures. Ahhh looks like it’s 1300Watts. But doesn’t say if that’s true for the economy or compact versions. Still what an awesome idea! I suspect you could phone or email if you really wanted to know. The 1300 watt consumption is the same regardless of which RO system is attached. The higher output RO case increases the surface area of the membrane, but does not change the flow rate. As such, unless you are physically space constrained, most people buy the high output case. – Ron from Rainman. Thanks Mike, Great write up . 1. The motor in the gas/petrol version is indeed Honda. It’s the GXH50, which is the same motor that is in the Honda 1kva generator. The reason we can get by with a smaller motor for this system is that there are no losses associated with conversion to/from electricity. As such, the AC electric version of Rainman requires a 2kva generator to account for those energy losses. 2. I can see from the photos that Gary’s unit does have the optional second pre-filter. It has a 20 micron and a 5 micron for pre-filtration. Our standard system has a single 5 micron filter. Either option filters to 5 microns. It’s a matter of changing one filter twice as often, or two filters half as often. 3. We estimate that about half our customers have installed their Rainman systems. Always good to have options. Thanks for clarifying all of that! Thanks for posting this up, interesting concept for sure, but for full time cruiser, is it really practical to drag this sucker out every time vs. having a pre-mounted unit that’s all installed some where accessible so all you’d have to do is flip the switch and let it flow. My dream is that 9 years from now when we’re ready to untie the line, we can run the watermaker off of lithium batteries! Seriously though, taking this watermaker out of a locker and dropping the hoses overboard took no more time than it did for me to remove all of the stuff stored in the way of the permanently-mounted system that we had on the Leopard. I’m talking 1 minute or so. 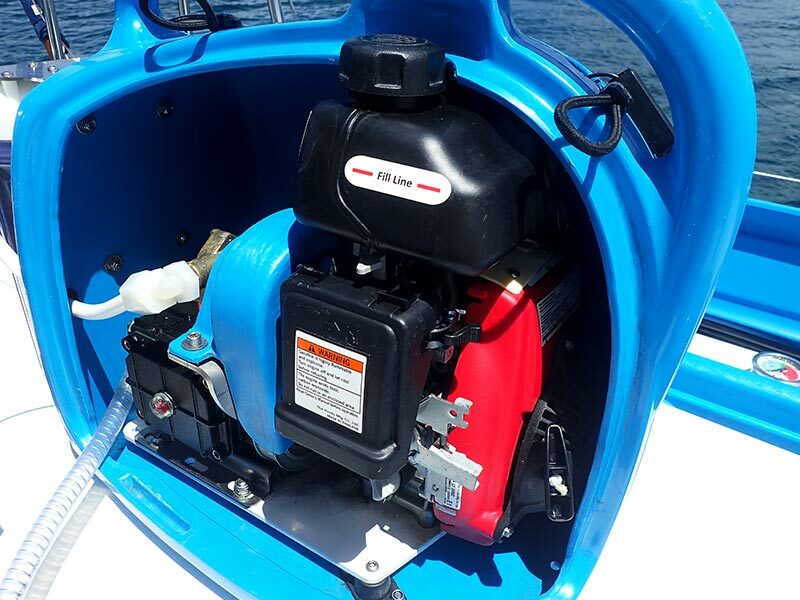 A permanently installed watermaker does not necessarily include extra holes in your boat. When I installed our Echotec I did not put in any extra holes. You usually have at least one intake for seawater. Engine cooling, seawater in the galley etc. I used one of the existing ones. Some thing with brine. Used one of the outlets for a bilgepump that comes out well above the waterline. Of course thats true, Hakan. I installed two different water maker systems, one on ZTC and one on the leopard. In neither case did I drill a new hole in the boat. I either T-ed off hoses or re-tasked unused through hulls. As I see it, not requiring through hulls is only one of the benefits of such as system though. 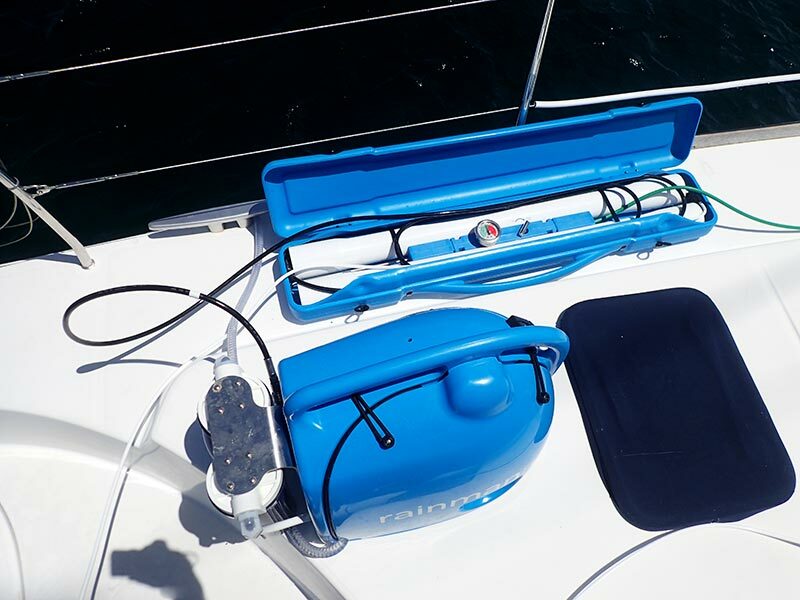 One of the nice things about this system is that when you sell your boat and move on to a bigger or better one, your water maker can go with you. 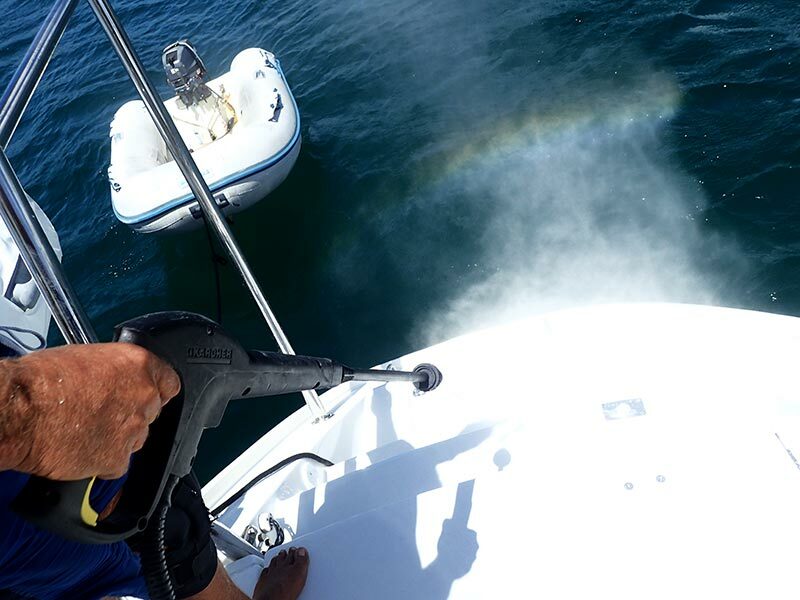 Spending $7K on a permanently installed watermaker does not increase the value of your boat an equal amount. I agree. You can take it with you when you sell the boat, or even bring it to a friend’s boat if it is needed. what about plugging it into a 2kw inverter with a large battery bank. Should run I would think. Anyone try that ? Even if would run, that would be a very inefficient use of power I would think. They do sell DC units. For someone who doesn’t want to go the generator route, that would be better IMO.